I just found out that one of the most popular services offering custom postage is temporarily bowing out of the game. Well, I hope it’s temporary. Zazzle.com is not offering custom postage right now. I have several friends with open orders left in limbo – yikes! And while I far prefer vintage or thoughtfully curated modern postage to having a 2D barcode plastered on your invitations, custom postage can be a nice way to finish off an invitation. If I recall correctly, Zazzle may have been the very first to offer custom postage (feel free to comment if it was someone else) and their temporary pause on the service (and apparent quibbles with the USPS) might mean our other options might follow suit. Of course, it’s a story in-progress. This information is so new that the USPS website still lists Zazzle first as a provider of custom postage. (the two other services have clearly merged into one, so this may be more an issue of slow-moving bureaucracy than bleeding-edge journalism). If you ask me, I will almost always recommend curated postage. There are some great companies offering that pre-curated sets and custom picking (though there can be a substantial lead time). Consider Vintage Postage Shop, Pack and Post, Little Postage House, or Treasure Fox. But maybe you desperately want to have your monogram perched next to a gangly QR code at the top of your invite – Can you tell how I feel about it? 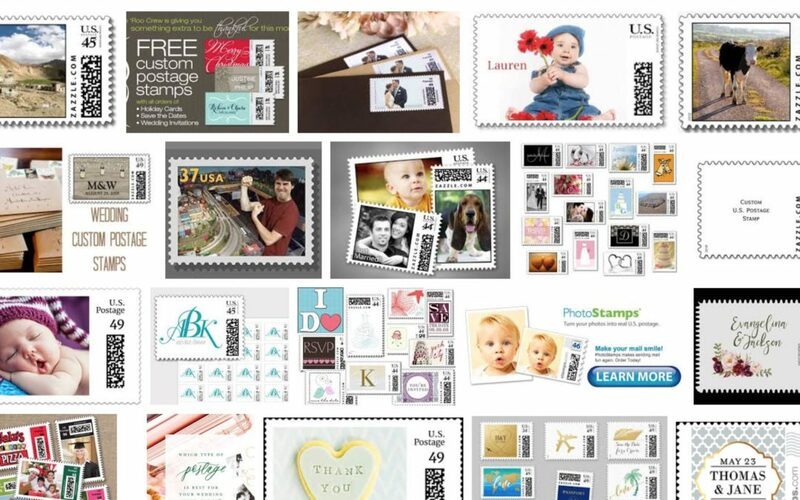 As I’m writing this, stamps.com is still a great option. Shutterfly and Minted are good options, too. I’m not sure how long this will last, but I wouldn’t doubt if the other providers follow suit and (temporarily) cease offering custom postage before this all gets worked out. If you’re planning your stationery right now, consider getting an order in today before things go further south with this.